Can I just confess here that I am completely drawn in at the wonder of all the activity in the vegetable garden! Every day there are new things to notice. The extremely warm, sunny days we've had this past week have caused an increase in plant sizes at a very fast rate. Flowers and fruits are starting to set faster than I can keep up with. It is a fact this part of the garden is all at once enticing me with its sights and sounds. The very things I was hoping to acheive are happening all around me. Bees, flies, wasps, butterflies... all buzzing around from place to place drawing me in to watch and notice with sheer excitement. 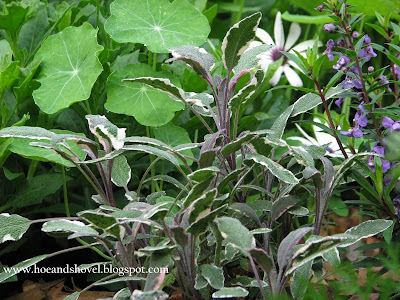 The tri-color sage ... such a pretty little plant as a companion to the carrots, limas, nasturtiums and blue-eye asters. 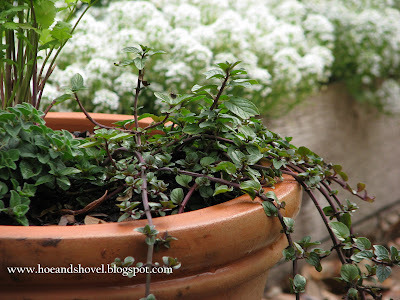 Chocolate mint, Mentha piperita cv. with that oh, so yummy scent and wonderful deeply colored brown stem contrasting with its green leaves is irresistible. For controlling its overly aggressive habit it is positioned in a container between raised beds and grouped with oregano and cilantro. It is needful to pinch off a piece at each pass to just let the divine aroma of chocolate fill my senses. Tomato plants, parsley, sweet basil and bell peppers all keeping company in the tomato bed. For the record. All is not complete bliss. I have already smashed a few worms and killed a few aphids on the tomato leaves ... they really like the warm weather, too. Every day I'm inspecting the undersides of that pretty green foliage. We've got quite a good start with our tomato crop. Eight days ago I reported the pole bean tendrils just beginning to wind their way up the poles. Just have a look at them now... they are two feet taller and making their way up to the top of the trellis. They've started to flower along with the rest of the bean family... green beans and limas, too. 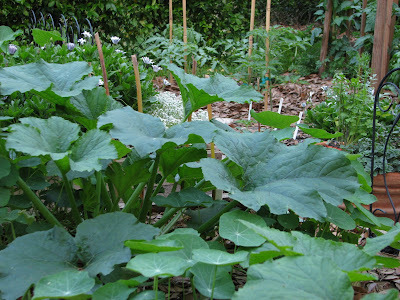 I LOVE the wide, prickly, stalks of squash leaves. I sowed some squash seeds in the back yard in a bed with some agapanthus--- just for fun. To me... they could easily pass for a tropical plant. And look a little closer. 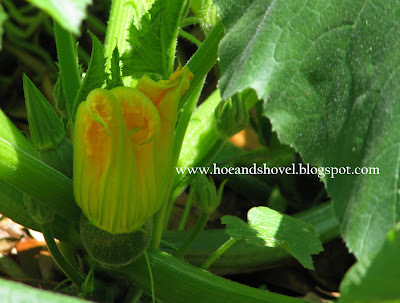 One day there was a flower and the next day (look below the flower) there is already zucchini growing. It is simply fascinating. If only the entire landscape would grow so quickly as vegetables once they get started. 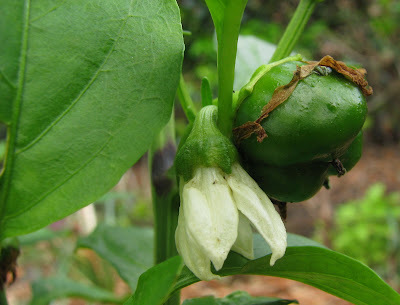 Green bell peppers are blooming and starting to set fruit. I've put the pepper plants in a few planting beds this time rather than grouping them all together. It adds a bit of whimsy to the garden not to have everything placed where might be expected. 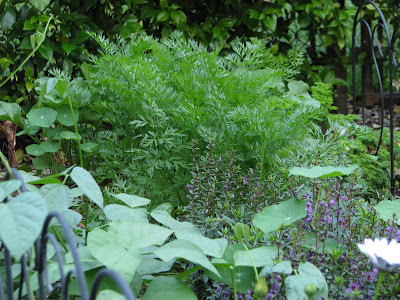 The feathery carrot tops next to the lima beans make a pretty picture. 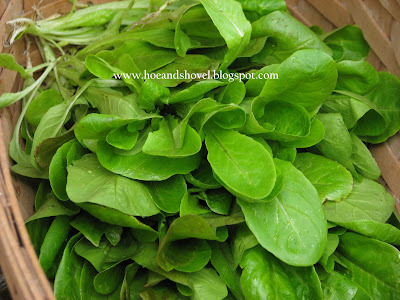 And the "Little Gem" and "Petite Rouge" lettuce has been delightfully sweet and tasty in our spring salads. 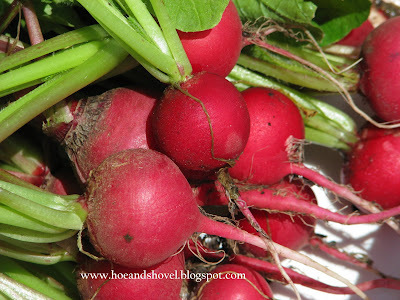 Is there another color more bright or more clear than the cheery red of "Cherry Belle" radishes in the garden? Every empty space in the garden has a few radishes tucked in. I've been planting them in succession since November. They are great for making any gardener feel accomplished aren't they? Thanks for indulging me for another round of photos from the veggie garden. I find myself snapping away with every pass through. Vegetables and fruits ARE beautiful. Now I am hungry and what I have to eat for "lunch" here in a little while does not sound so great now. Thanks for sharing! your veggies look absolutely scrumptious. everything is doing so well. those baby greens lovely and so tasty i am sure. i can't wait to have ours in the ground growing wildly fast too. i am so happy for you that things have gone relatively easy, even with a few bugs all looks so lush.you and mr meems may never want to eat out again after the freshness from your garden. hope you are enjoying every minute of being in your garden. A lot of plants that I've never seen before like zuchinni and bellpepper. Awesome. Thanks for sharing. Meems, your post looks like an advertisement for promotion of veggie farming! Everything looks so lush and bountiful. And not a chewed up leaf in sight! What do you do for pest control? Chocolate mint? I dont think I've ever seen it. Or atleast I dont know it by that name. Does it smell / taste of chocolate? Meems your veggies look sooo healthy. No signs of slug and snail damage. Everyone will be asking like Sunita what do you use for pest control? I see and feel your excitement in the veggie garden. From flower to fruit it is just amazing how life begins. Great post!! Wow! So beautiful. Great work! It is so exciting for me to see your garden Meems. It won't be long and we will be able to plant out some of these things. Your photos are so beautiful. The beauty of vegetables! Your garden reminds me of farmers markets and garden markets. Your garden looks so far along. The squash plants are huge and tomatoes and peppers. Our pepper plants just sprouted this week. Oh, I am so jealous of your garden. We are a little farther north and things are just getting their legs. All of the rain has made the slugs the dominant species in our yard and they are having a buffet on our tiny plants. I have to go and have a talk with my plants now. Thank you for posting! Isn't it great to see plants --especially food plants we haven't seen before --growing! You picked a good time to stop by. I would love for anyone to be encouraged to start a veggie garden if they have any desire for it at all. It is so rewarding the words are hard to come by. I'm growing this garden as organic as is possible. You may remember I studied up a bit on companion planting this year. The goal being to draw in all the beneficial bugs that will automatically take care of most of the bad bugs. I think it is working to a great extent so far. But it is important to say here that when the humidity comes with its fierceness so do the bugs. SO FAR I have only used my trusty fingers to smash the worms and slugs. There have been several toads spotted throughout the garden helping me out with the slugs. It is SO exciting. I have to tell you, this time of year it is just so lovely here. The veggie garden is in the side yard so I pass through it several times a day to get back and forth from the back to the front. I'll add to my reply to Sunita that I have armed myself with some organic pesticides just in case things get out of hand in the future. I would really like NOT to use any. We'll see about that when the humidity comes to stay. Thank you and so happy you dropped by. Yes, be encouraged... it won't be long and you'll be posting beauties of your own ... maybe you'll start with your wonderful window box or your planter by the front door? Thank you...but... it's not quite that mature even though it is growing at a phenomenal rate... which is the part that amazes me. But when you think about it vegetable plants have a short term life span so they have to fit it all in very quickly! Yay for your pepper plants. Once they sprout and the sun warms their leafy foliage the growth rate is rapid. You, too, will be in awe of the beauty in a few short weeks. Hi and welcome. We desperately need the rain but you are right... it invites other issues as well. Florida gardening is not for wimps is it? Find some toads and show them the garden... they will do their best to eat those slugs for you. The rest of them require lots of hand picking... not the fun part for sure. Here's to the cooler weather lasting a little longer so all your plants get their legs quickly. I am so looking forward to my vegetable garden being as far along as yours is. Our temperatures may, I said, may, reach 60 degrees today. Your garden is looking fabulous. Your garden just looks incredible. I love home-grown 'maters (ha) and radishes... On and ON and ON!!!! WOW---I'll be there for dinner when you start eating all of those veggies!!! I agree, and I love seeing your vegetables growing and the flowers. Very, very attractive! Thank you for letting me into the garden for a peek. I love the veggie garden too. I think fresh from the garden is the best eating. Your plants and "fruits" are beautiful! Love how you fill every nook and cranny of your veggie garden - it's all so pretty - after seeing your beautiful radishes, I think I'll tuck a few in . . . they are entirely different from anything you can get at the grocery. I adore chocolate mint. I always try to keep some. As well as other varieties of mint. You're going to have some really good eating soon! Hi Meems, a tropical paradise made even more heavenly with the edibles. You are having such a great success. I love the interplanting of herbs and flowers too. You have inspired me as we await our hopefully final frost this coming week. Beautiful indeed! 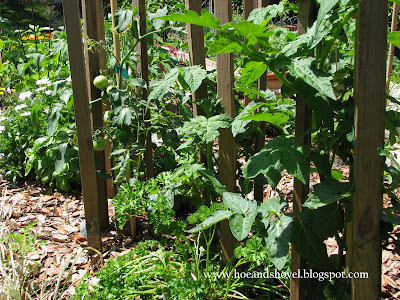 Your veggie garden looks so lush and inviting. I just now got some my early plants out...lettuce, collards, peas and beets. We had our first real day of full sunshine in several weeks. 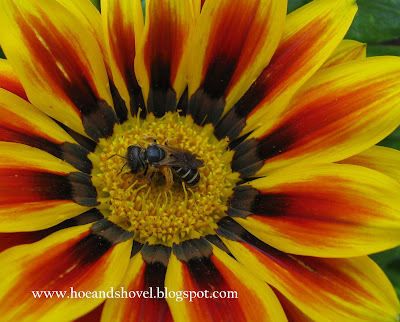 How lucky to have so much happening in your garden! Your photos are so nice! Our vegies are barely getting started indoors let alone out in the garden. I like how you've mixed some of your herbs and vegies along with the nasturtiums. I am so jealous you have tomatoes already. That is the single thing I most look forward to and our season is very brief. July, Aug and Sept and then a frost hits and they are gone for another year. Really enjoyed the stroll thru the veggie garden, like the flowers in there too. Your veggies look fantastic! So far I only have red and white onions planted and some hot banana plants. I had to cover them last night and again tonight due to the low temps. 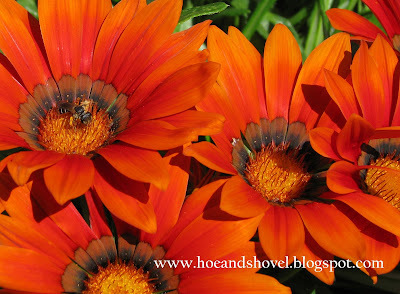 That gazania in the first two pics is beautiful. They have such happy faces. Your veggie garden is a thing of beauty, Meems :) Seeing your lovely photos makes me itch to get out there and plant some veggies, but our soil is still cold and wet. I'm trying to be patient...but my patience is beginning to wear thin. Those radishes couldn't be prettier! It will never cease to amaze me that you have peppers and tomatoes already fruiting in April, Meems! 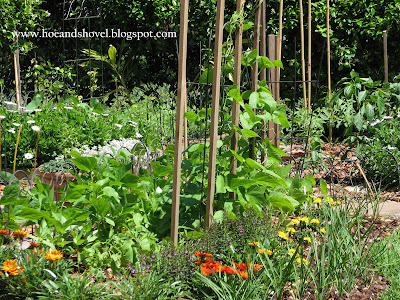 Your veggie garden is a thing of wonder, beauty, and deliciousness! What a beautiful garden! 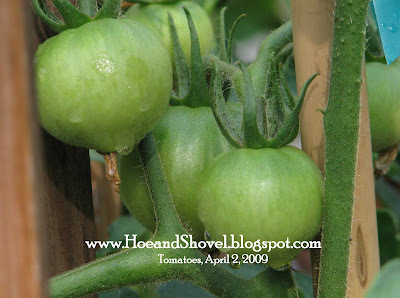 I'm still a month and a half away from putting out things like tomatoes. 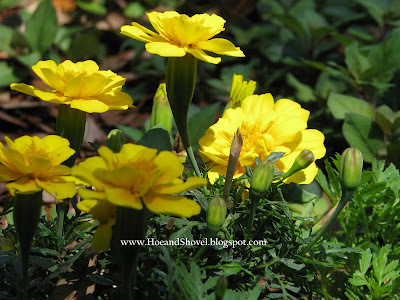 Your garden pictures are reminding me to hang in there, good growing is just around the corner. Thanks for the great pictures!